Coincidentally sending this on the day the hurricane is forecast to hit Hawaii Island about 4 pm and continue through the night. Take good care! B. Bassiana is a GO! On July 23 the KCFA, along with the Kona County Farm Bureau and the Kona Farmers Union, co-sponsored a two-hour candidate forum on agricultural issues. Held at Konawaena Elementary School, the forum included candidates for State House of Representatives for District 5 [Richard Creagan (D), Buckey Leslie (D), David Bateman (R), Randy Ruis (N)]; and District 6 [Nicole Lowen (D), Kalei Akaka (D), Roy Ebert (R), Kelly Valenzuela (R)]. KCFA member and Holualoa coffee farmer Sandra Scarr moderated the forum. The first question posed to the candidates was whether they would support legislation to require the disclosure on labels of the origin of the 90% foreign coffee in 10% Kona blends. All the candidates said they would support that disclosure requirement—except David Batemen who said he supports disclosure that 90% is “foreign-grown coffee”, but not disclosure of the country of origin the foreign coffee. His reason was that blenders often change the source of the 90% and it would be too costly for them to constantly change the labels. Rep. Nicole Lowen noted that she had introduced a bill in the last legislative session for disclosure of the 90%. That bill did not pass, but she pledged to introduce and support the same bill in the 2015 session. Other issues addressed by the candidates included assistance for farmers markets, a mobile slaughterhouse for Island cattle producers, restoration of mandatory inspection of green coffee, video conference testimony to legislative committee hearings for outer island residents (including farmers), support for Hawaii County’s right to ban open field planting of new GMO crops, availability of affordable land for new farmers. The forum was important in introducing the candidates to issues of concern to West Hawaii farmers—and in showing that agricultural issues will be important in our voting decisions. Mahalos to the KCFA volunteers who helped make the forum a successful event: Anita Kelleher, Kally Goschke, Kurt Schweickhard, Bruce Corker and Sandra Scarr. Thanks to the recommended use of Beauvaria bassiana and the plentiful rainfall, the crop for this year looks great. I often think coffee is a biennial bearer and this would be the plentiful year. I am keeping my fingers crossed! 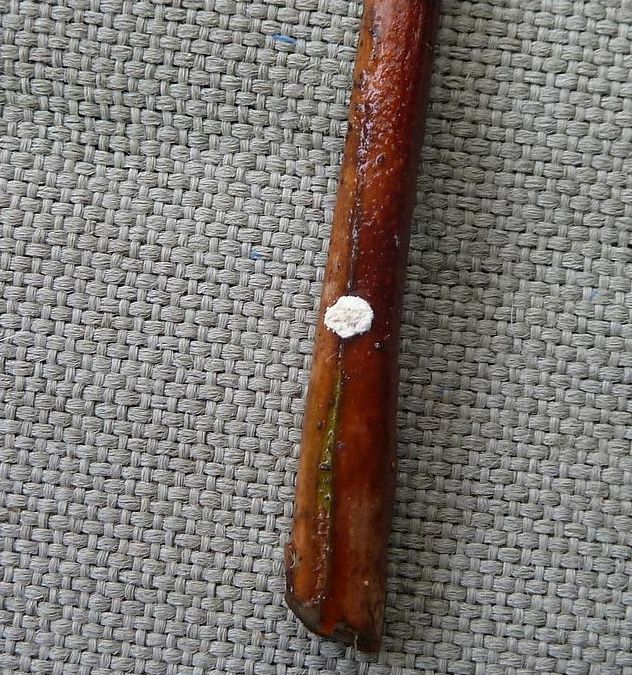 The suggested monthly spraying of Beauvaria bassiana has certainly impacted the CBB here in Honaunau mauka- however the Black Twig Borer (BTB) continues to be menacing. The good news is that on my last BTB sampling in July 2014- 11.5% of the BTB is being killed by the Beauvaria bassiana. (see photo). We just need to figure out how to make the Beauvaria bassiana more effective on the BTB. This is why we need an entomologist in Kona. I spoke to Scott Enright of the HDOA last week, and he assured me that we will have an entomologist- “within a year”. Rob Curtiss the entomologist whom we fought so hard to have here, has been temporarily re-assigned to Oahu and once again- Kona has no entomologist and no one working on the BTB. KCFA Beauvaria bassiana Grant is a GO! Having received the first funding installment from the Hawaii Department of Agriculture last Friday, the KCFA’s B. bassiana Grant is up and running. You will receive 50% off either Botanigard or Mycotrol by having attended one of the KCFA’s Refresher workshops and then completing the application, and finally taking the Voucher to either Farm & Garden location. You can buy up to two (2) gallons at one time and then repeat that after 30 days. You can also join a hui to share the use of a Mist Sprayer which is most effective for dispersing the fungus – for this, email mbondera@kohalacenter.org for more information. FYI, you will save about $90 per gallon of Botanigard and about $127 per gallon of Mycotrol with our Bb Grant Vouchers, and that is a real gift for your Kona coffee farm. In reviewing the applications, the range of estimated infestation ranges from a high of 60% to a low of 2%. Safe to assume that those who have been regularly spraying during this plentiful rain year have the lower rates. Remember that high humidity encourages the germination of the B. bassiana. Monthly spraying of B.bassiana is recommended except for December, January and February (since B. bassiana is not effective in the dry season). We have added 2 more sentences to our Voting Farmer Member application and one to the Associate Member application to further clarify our stance and qualifications for prospective Members. Qualifying new voting members ensures farmers’ interests are maintained in KCFA. There is strength in numbers when we advocate for Kona coffee farmers’ interests with the legislature etc. Although the results may sound like a coffee advertising executive’s dream come true, the research on coffee and suicide was conducted by professors of epidemiology and nutrition at the highly credible Harvard School of Public Health, and published in July, 2013 in The World Journal of Biological Psychiatry. The study, which took over two decades to complete and involved nearly a quarter of a million participants, showed that people who drank two to three cups of coffee a day are at much lower risk of killing themselves than drinkers of decaffeinated coffee and non-coffee drinkers. In fact, daily, moderate coffee consumption slashed suicide rates by almost 50 percent – a truly astounding figure. One can’t help but think that if a pharmaceutical antidepressant achieved this type of dramatic benefit, manufacturers would be shouting it from the rooftops. The results, although surprising, didn’t come out of the blue; past epidemiological studies have shown lower rates of depression among coffee drinkers. Researchers believe that coffee’s mood-lifting effects stem from the way it increases production of neurotransmitters such as serotonin, dopamine and noradrenaline. Read more in this article atNatural Health 365 with most recent research on the benefits of coffee. Something new to worry about? No, mycotoxins are actually one of the oldest grain and seed agriculture issues and just something to be more aware of now that we have coffee berry borer. Mycotoxins are a secondary by-product of molds like common Aspergillus species; for coffee that toxin is specifically ochratoxin A. They occur mostly in grains but also in coffee and have been associated with organ failure, cancer, and animal death from contaminated feed. Elaine Ingham, a soil microbiologist (soilfoodweb.com) says “Aspergillus makes the toxins to prevent other organisms from eating it. So, the critters that eat the Aspergillus need to be present and functioning before the fungus has the time to make the toxins. Typically, it takes some time for the fungus to make these mycotoxins. Good window of time to prevent the problem.” In an intact forest, trees naturally have leaves and branches completely covered with full microbiology of bacteria, fungus, good nematodes, protozoa, and arthropods, with zero space uncolonized. This keeps the undesirable bacteria, fungus, nematodes from colonizing the spaces. In our treated and partial biologically active coffee trees in our fields, a farmer could fill these spaces and ports with good biology so the damaging biology doesn’t have access. Promoting full biology could also aid the survival of Beauveria on foliage along with other carnivorous fungi like Metarhizium and about ten other fungi types that impact coffee berry borer that are known so far. citation Full biology on foliage would also assist foliar feeding utilization and uptake. A medical student says bunco! When Jesus Maria Aguirre saw his coffee bushes wither away, he knew that he had lost the sole source of income for his family. “We would go to collect coffee and would come back with our baskets nearly empty,” says the Colombian grower, recalling the pernicious effects of the “coffee rust” fungus, or roya. 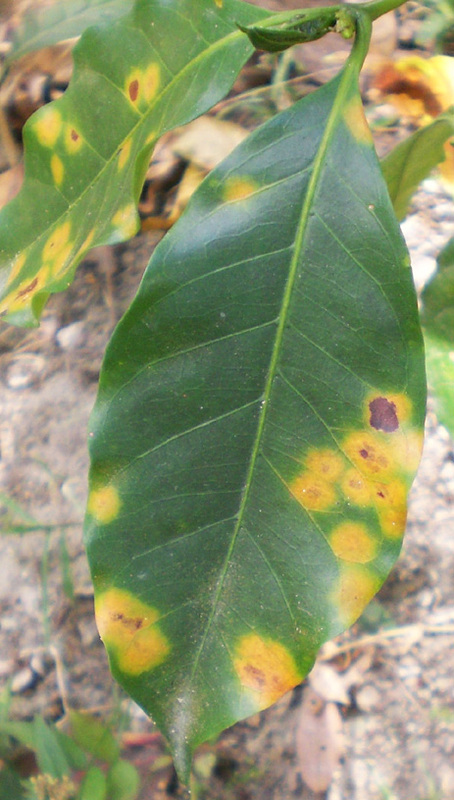 The fungus stunts the growth of the fruit of Arabica coffee plants. It infected about 40% of Colombia’s crop between 2008 and 2012. Production plunged from a high of 12.6m 60kg bags a year in 2007 to just 7.7m bags in 2012. As supply from Colombia shrank, international buyers turned to growers elsewhere. What Mr. Aguirre went through then is now the lot of farmers throughout Central America, the Dominican Republic, southern Mexico and Jamaica. Production there fell by 30% between 2011 and 2013 because of roya, reckons the International Coffee Organization. USAID thinks it has caused $1 billion of economic damage in Latin America since 2012. This time Colombians are the ones taking advantage. ON his farm on the slopes of the country’s central mountain range, Mr. Aguirre today presides over 1/.5 hectares (4 acres) of healthy bushes plump with red berries. For yields to recover, he had to yank up fungus-prone bushes and plant a new variety that promised to fight off the blight. He was one of thousands of farmers who joined in a countrywide scheme run by the Colombian Coffee Growers Federation, which represents more than 500,000 independent growers. By June 2014 more than 3 billion bushes had been replanted. Three-quarters of them were replaced with a roya-resistant variety known as Castillo, which had been developed in the labs of Cenicafe, the coffee federation’s research arm, after 13 years of selective breeding. Lindsey Bolger, head coffee buyer for Keurig Green Mountain, a roaster in the United States, said the industry was “on pins and needles” about whether the Castillo would work. It has, Colombia produced 11.5m bags in the 12 months to June 2014, up by 31% on the previous 12-month period, according to the coffee federation. Buyers are coming back. Fernando Gast, Cenicafe’s director, says seeds of the Castillo coffee plants have been sent to Mexico, El Salvador and Costa Rico for evaluation. But he warns that Colombia’s success story is not directly transferable to Central America. The Castillo variety was created for Colombia’s needs and may not adapt to Central America’s soil and climate, he says. Cenicafe’s 89 researchers cannot rest easy, either. They are working on a project to may the coffee genome. That should help them develop new varieties that will not only resist roya, which is continuously evolving, but will also be less susceptible to erratic weather. The search for a stronger brew is never over. Place chocolate chips in small bowl. Bring brewed coffee to simmer in small saucepan; pour over chips and stir until melted and smooth. Let ganache stand until cool and beginning to thicken, about 1 hour; spread evenly over brownies. (Can be made 1 day ahead. Cover; let stand at room temperature.) 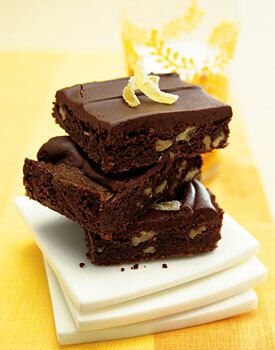 Cut brownies into 15 squares. Top each with 2 ginger strips.